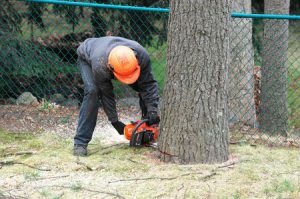 Most people don’t think much about the trees on their property until one of them becomes “an issue,” as in “safety issue.” When is there a need for emergency tree removal services from a company like Forest Tree Service? If a tree looks like it could cause harm to people or things at any moment, then it’s time to call a professional tree company to come deal with it. After a storm rolls through your neighborhood, sometimes trees will break and/or fall down. If you’ve got a mess on your lawn or near your house, and you need an emergency tree removal done sooner than later, then call Forest Tree Service at 281-381-4125 right now. Maybe it was a terrible wind storm, or perhaps sheets of whipping rain came through last night? Depending on the time of year, maybe ice ruined the tree… Whatever the details, if there’s a tree down that’s making it impossible for you to pull your vehicle out of your driveway, or it’s hitting the house, then it’s time for it to be removed. Do you suspect you’ve got a tree with a hollow trunk? Even though hollow trees can live for years, they’re not strong. Indeed, a hollow-trunked tree is in danger of falling– and if yours is leaning, chances are its roots have weakened or become broken. You might want to get it removed. Also, check to see if the tree that concerns you looks damaged. For instance, is there a really heavy, big branch that has separated from the tree, and one strong wind could cause it to crash to the ground? If so, you’ll want to get that branch removed quickly. Meanwhile, look at the area around the bottom of a tree. Do you see exposed roots that don’t look quite right? Decaying/damaged roots mean the tree is weak, and it could topple over. Also look for missing bark, giant holes in a tree, and/or cracks in the trunk. Whenever you think a tree might be structurally deficient, then it’s time to have a professional check it and remove it immediately, if needed. Forest Tree Service of Kingwood, Texas, does emergency tree removal services; call 281-381-4125 to speak to someone about removing a tree on your Texas property that’s causing you concern.